Kelsey was elected to the board in January of 2018 as the Volunteer Coordinator. 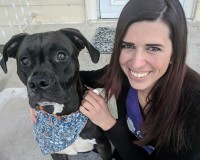 Her role is to recruit and lead volunteers for all FOM events including Pet Expo, Pints for Pups, Walk Run Wag, and Barktoberfest. If you’re interested in volunteering at a FOM event, please contact Kelsey!